In August 2015, following a heavy weekend with stellar gigs by Fantan Mojah, JAMALSKI and The Wanton Bishops, The 264 Cru escaped to the beautiful Adriatic coast of Croatia to attend the Soundwave Festival - a boutique festival, where incidentally the Cru’s own DJ MoCity was also billed to play at, is known for its unique setting, laidback vibes and exceptional bookings. Now entering its 8th year and rising in popularity, one of Europe's most friendly and intimate festivals promised to showcase a mix of mature electronic acts and alternative live performances that has something for everyone. In addition, the warm sun could be enjoyed sailing the Argonaut, Soundwave’s party ship where you could expect to hear anything from broken beat, reggae, afro to acid jazz, hip-hop, soul, funk and drum & bass by visiting DJ’s and performers. Nestled in a small fishing village of Tisno, the festival certainly lived up to our expectations, and was one of few festivals that had great food offerings (in and around the festival) that definitely added to a wholesome festival experience. Read on for our take on the experience and start planning! Tickets for the 2016 edition are going on sale now! The closest international airport servicing Dubai nonstop is Zagreb, the capital of Croatia. There are a few options on how to get there, so it really all depends on your budget and how much time you want to spend travelling. Currently, the only direct flight is with flydubai. Once there, you will have to get a connecting flight or make your way down to the festival by train or bus (more on that below). If you prefer to fly into Zadar or Split (the closest airports to Tisno) you can do so with Austrian Airlines (via Vienna), Lufthansa (via Munich or Frankfurt) or Smart Wings (via Prague) for a higher fee. If you do choose Zagreb, you can take a bus directly towards Tisno (~4.5 hours) or, if you prefer a break in between, you can even catch the pre-party in Zadar (~3 hours) and then take a local bus to the village of Tisno the next day. If you land in Split, there are official festival transfers (they sell out quickly!) and local buses that make the hour journey into Tisno (check bus schedules here). The other option is to rent a car in wherever you land - makes sense if you are a group of 4 or more, although returning the car is a bit of a mission (as none of the major rent-a-car companies have offices in the village itself). 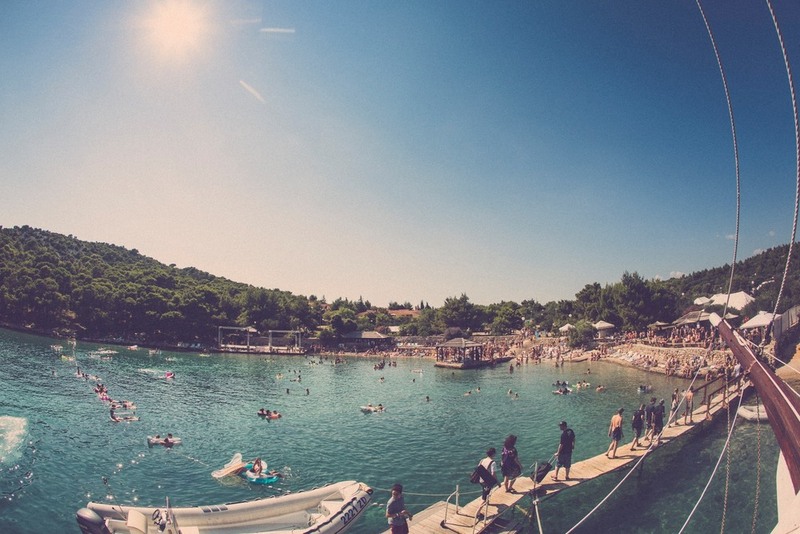 For more information on transfers and cheap flights within other cities in Europe, check the festival site at http://www.soundwavecroatia.com/travel/. With Croatia is becoming a major European hub hosting over 20 plus quality festivals a year (Outlook, Dimensions, Exit, Hideout amongst others), it seems hard to find a location that maintains the small town charm while providing excellent facilities and great value. However, Tisno does that just perfectly; The Garden Tisno camping area is a year-round facility that can host roughly 2,000 people, ensuring the friendly and chilled vibes of a camp site remain day in and day out. We definitely recommend staying on site, as anything else will require you to have a car or to learn the limited and unreliable local bus schedules! In addition, most of the best options sell out quickly, so be ready to pay for the deposit and avoid the hassle of trying to a place off site. Depending on your budget, you can go from the cheapest options of DIY Camping (bring your own tent) and Indian Shiker tents to retro airstream trailers with air conditioning, apartments for 2 to 4 people or steeze out and book yourself the Yacht Gulet Babac, the only one moored in the Garden Bay (fits 10 people). Besides airbnb, you can also find space on some local websites where you will have to deal with the owner and the process yourself. Good external resources are Croatia Bay and Love Music Travel. Again, keep in mind how far away the festival is from the apartments, and may require either a tazi ride, a bus ride or a relatively long walk. If you love food, you’re going to have a field day with some of the munch that is on offer. From smoked ribs to 18-inch Italian paninis, the food was well above the standards of other festivals we’ve been to, which we also acknowledge might have a direct correlation to its price. The only restaurant serving proper hangover recovery breakfast, as well as fully prepared lunch and dinner, operates all year round, so you know their ingredients are fresh and the cooking is of high quality. In addition, there are over 10 food stalls strategically placed around the Garden serving smoked ribs, deli sandwiches and shawarmas, juices and tasty desserts. As far as alcoholic beverages go, the prices in the festival were definitely higher than if you bought booze outside. We brought our stack of duty free goodies and that lasted us the duration of the festival, so definitely try and stock up if you can. Bars were spread out throughout the festival site and payment was only in cash. In general, the festival is quite well organized, safe and it feels like a big party among friends. With that being said, it also attracts a rather young crowd that come in large groups - at times it felt a bit young and cliquey. The festival is spread over five days, with three festival stages, the Argonaughty party sail boat and the open air after-party spot, Barbarella. Here is our two cents on each and what not to miss out on. There were a few impromptu pre-parties that seemed to be planned a bit last minute and without much advertisement - one in Zagreb and one in Zadar. The pre-party in Zagreb took place at the Swanky Monkey Garden, a cool rooftop bar where we got the opportunity to meet local Zagrebians and down some nice local Ožujsko beer. We didn’t make it to the second pre-party, but we assume it would have also been a relatively intimate affair. There were a total of 13 boat parties spread over five days, leaving the pier at 1pm, 4:30pm and 8pm, with each trip lasting 3 hours. These were definitely one of the highlights of the festival … the vibe, the music and the fun that ensued led to a great way to spend the day before the main acts got underway on land. The festival had 3 stages; a beach stage right on the water, a mid-sized marquee style tent and finally the large ‘main stage’ in the middle of the festival grounds. Moving in between stages was easy and seamless, with each of them being within 3-5 minutes walk of each other and never being suffocatingly packed - enough space to dance, chill or socialize. This also meant losing your friends was almost impossible and the campsite was a stones throw away - something rare you probably won’t get at larger festivals. The sound systems were impressive, even at the smaller beach stage, where you could be lounging or swimming in the water while clearly listening to the sounds of the DJ on decks. The larger stage had the perfect sound to complement all styles of music, may it have been Channel One, Mr. Scruff & Alex Nut, Andreya Triana or dubstep don Mala. One thing that really stood out, which we’ve mentioned before, is the ‘family vibe’ of the entire festival. Where most festivals have security guards looming everywhere, with friendly volunteers few and far in between, Soundwave felt like there was no security (in a good way), leaving you at ease to enjoy in whatever way you wanted. We also hung out with the festival directors (a cool middle-aged couple) several times, as they would just walk around and strike up conversations with festival go-ers and ensure everyone was having a grand time - that was definitely special. Apart from music, the festival grounds also served as a kind of canvas, with several artists from all over Europe turning the walls of across the festival site into living, evolving pieces of art. This was a nice touch to complement the greenery around the festival area and a way to explore some of the local artists. The after parties were held at a big outdoor club called Barbarellas. Although getting there (especially after a full day of partying) was a bit of a mission, it would be well worth it to catch some sick acts early into the morning hours. The club is located 30 minutes away, which required you to board the festival provided buses to get there. The party would kick off at 2am and last until 5am (ish), with transfer and club tickets costing extra to the normal festival ticket. It was always fun to be on a bus with a bunch of ‘excited’ festival go-ers, as a lot of unexpected stuff would go down. For instance, this one time, our homie Ratish (for some unknown reason) started singing the Lion King theme song, and before you knew it, the entire bus broke out into a Lion King musical for 30 mins. DJ Mocity - One of my favorite moments, other than performing there, would have to be stumbling back to the beach stage from a boat party and hearing Aurora De Raynes voice over Touchy Subject’s productions. I love having a list of acts I’m going to check out for sure but the idea of hearing something I’ve never heard and falling in love with their sound is one of my main missions in attending festivals across the world. At Soundwave 2015, that magic moment was definitely Aurora De Raye & Touchy Subject’s beach set. Like the character from Greek Mythology, Jason (apt because the boat was called The Argonauthy), the siren call of Aurora’s voice beckoned me off the boat and towards the stage. The bed of 160 bpm beats provided by Touchy Subject kept me afloat while Aurora eased me back out of the waviness that was induced from previously mentioned boat party. If you’ve managed to make it this far in the article, congratulations, you’re a seriously loyal fan of The 264 Cru, now pass me the Dokha, I’m fiending. C.O.B - Though I have seen him play before and arguably on a bigger setup, this set by Mala was truly special. The visuals and sound were top shelf, and there was enough space in the ‘sweet spot’ allowing me to ape out without elbowing anyone. I still remember when he dropped his track Changes, but the James Blake Harmonimix version (which I hadn’t heard before), and with the overwhelming visuals, it all just blew my mind. Another memorable moment was steppin with the true rastas, the preachers armed with only a mic and dubplates, Channel One Soundsystem - 5 hours of straight roots and power dub that is something you rarely get to experience in Dubai, so I went all in. essarai - Definitely the standout gig for me was Mr. Scruff b2b Alexander Nut (with guest appearances by Fatima and Chunky on mic duties, what a killer combination eh?) Watching the chemistry between the two DJs unravel before us as they also took steps back to laugh and joke around and probably discussing the tracks they were playing… it was really special. Also great to see Mr. Scruff after his Dubai gig and catch up with him, he’s a super rad, down to earth dude and of course after that just recently we had Alexander Nut here in Dubai completing the circle (you’ll recall I warmed up for Fatima at the Lemon Jam, and of course Chunky MCing at Karak and DJing at Future Sailors 001). Soundwave had great music all the time and apt for the time of day as well. The manageable size of the site also means you can simply change location if you’re not feeling it and not fear of never finding your friends again. It was also a great way to check out lots of acts I’d not heard of before and just get lost in the beauty of it all, the music, the smiles, and beautiful Croatia. As more and more festivals come up every year, especially in Croatia, it is good to see that boutique events can hold their own and give you a unique festival experience. This is also a festival you could treat as a ‘holiday’, particularly thanks to the intimate setting and laid back vibe, and not like other festivals that tend to be quite hectic, where eventually end up running between stages a mile apart, being pushed around by thousands of people. We would definitely recommend Soundwave to anyone looking to mix a getaway with some good music and partying. Not to mention, great grub to make sure you come back with that holiday belly! We definitely enjoyed ourselves to the max while meeting some cool cats and kicking it with a bunch of the artists that hung around for the majority of the festival. This in turn gave us the opportunity to host a few of the bigger names at our Karak Beats parties (Chunky, Mala, Alexander Nut). In short, be sure to follow our tips and we guarantee a good time.